Edible Flakes Market size is expected to cross USD 25 billion by 2025, according to research conducted by Global Market Insights. Increasing popularity of ready-to-eat food products will primarily boost the edible flakes demand during the forecast time span. Changing lifestyles coupled with busy schedules of personnel will drive them to incline towards processed foods leading to increase in consumption of edible flakes. Moreover, the demand for healthy foods are also increasing, as the future of the consumer is molded by healthier eating lifestyles, growing knowledge on food, and a value-driven outlook. Healthy eating is considered as one of the fastest growing type of cuisine in the coming years in the food industry. Growing consumers interest in healthy lifestyles is expected to show a significant positive influence on the growth of the product market. Additionally, overall growth in food and beverage industry will substantially improve the demand of edible flakes. These trends will surely drive the lobal edible flakes market in future. Lactose intolerance disorder will be a major hurdle for the edible flakes market growth in coming year as the product is generally consumed with milk. According to National Institutes of Health (NIH), around 65% of global population is unable to digest lactose properly. Lactose intolerance disorder is widely common in East Asian countries. Edible flakes market is divided into product and distribution channels. Based on product, the market is segmented into four major products which include corn, rice, wheat flakes and flakey oats. Corn flakes segment is likely to grow with a CAGR more than 8% in upcoming years due to increasing popularity of nutritious food products. Rice flakes segment will capture around 4% volume share at the end of 2025. Based on distribution channel, the market is classified in three categories namely supermarkets & hypermarkets, online retailers and convenience stores. Supermarkets & hypermarkets segment will register a revenue of approximately USD 12 billion by 2025. Online retailers will witness favorable growth trends with a CAGR more than 6%. This segment will gain popularity due to provision of single platform for large number of products along with customer convenience. Europe will be a major market for edible flakes and is likely to reach over USD 10 billion over the forecast spell. The consumer spending on healthier, and convenient foods grew due to promising economic development over the last few years. For instance, consumers in Germany have a developed preference for products with good health and wellness characteristics. 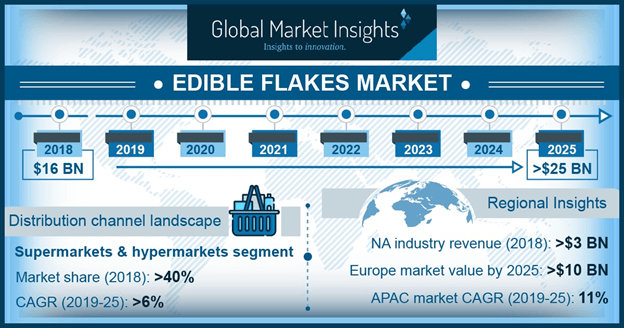 Asia Pacific shows prominent future for edible flakes market with a CAGR around 11%. This is all due to the shift in population growth coupled with positive economic trends over the time. Hence, will drive the food and beverage industry leading to rise in global market by 2025. The major manufacturers of the market are General Mills, Post Holding Company, Nestlé S.A., Dr. August Oetker, Kellogg’s, Patanjali, H. & J. Brüggen KG, Nature’s Path Foods, etc.